Strawberry and rose petal jam; my signature Dish. How does it happen that one is well known for such a strange combination? I have to boast, but I have Fans of This Jam. Strawberry jam is one of the quintessentially English things I used to read about growing up in Australia. Soft and subtle and barely set. I knew it was tricky to make as there was so little pectin in the fruit. 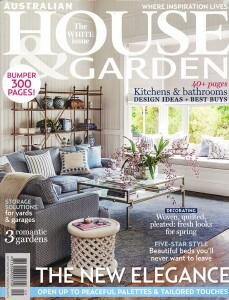 But it does evoke June in a lush and gentle countryside. Picnics. Floaty dresses, floppy hats. Scones. Clotted cream. So why do I get to make it, and make it my own, in this hot dramatic landscape of the Ardèche high in the hills in rural France? And combining it with such an English plant. The rose. 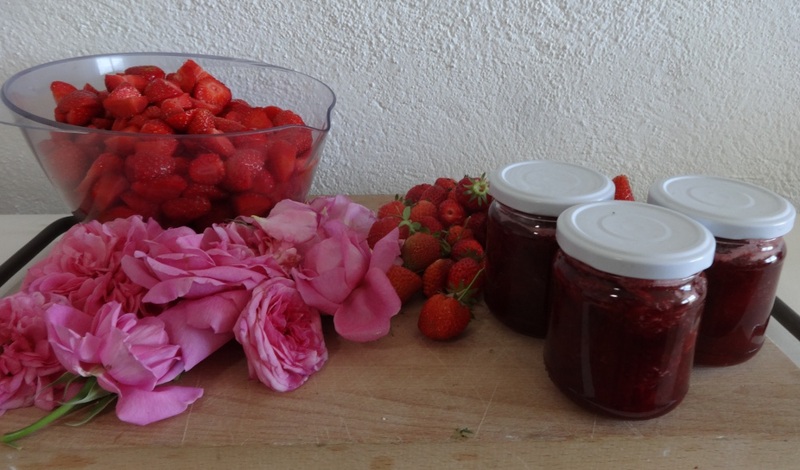 I could set up business as a Strawberry and Rose Petal jam manufacturer. But I’m strict. 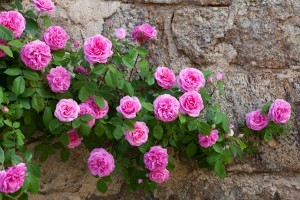 I only make enough jam according to the availability of my roses which grow in the courtyard in planters. And each year I have to wait impatiently to see when the roses bloom. End of May, early June, and sometimes I get lucky and get a second flush in August. That way I have the sublime delight of a second batch of strawberry jam. My strawberries (a good French variety called Mara des Bois) grow well into August if kept watered. But if the slugs get at them, or the hare, or the breakfast crowd, then the strawberries in the potager get augmented with a few punnets from Monsieur Bois at the market. So it is strictly local. Strongly scented roses work best for this jam. And my Gertrude Jekyll roses, bred by David Austin provide a very old fashioned perfume, combined with just the right light pink colour which blend well with the strawberries. 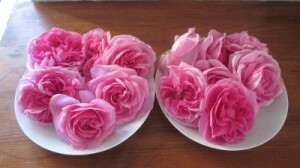 The just open roses are best as they are soft and the petals won’t affect the texture of the final jam. You only add the petals at the very end of the cooking time. But I do pick early in the morning and wash them well to remove the risk of bug life in the final product. If you feel you won’t get the scent from your roses, you can add a tablespoon of rose water at the end of the cooking time. I have adapted this recipe from a British Country Living magazine I found way back in 2006. I use jam sugar for this recipe (sugar with added pectin) as the strawberries are very low in pectin and can be difficult to set. 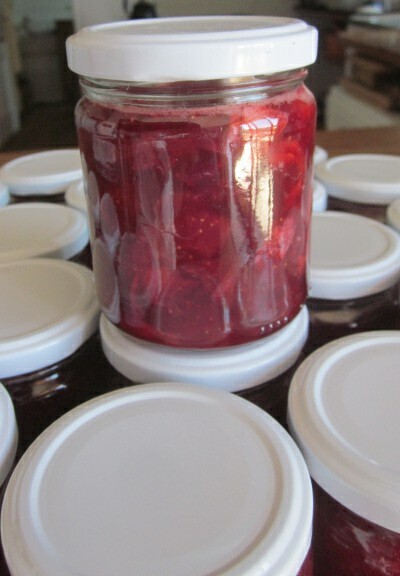 The following quantities make eight small pots jam. Place your saucer in the freezer in preparation for testing the set of the jam. Check over the strawberries, and wash any that are grubby and cut the large ones in half. Place them in a deep pan with the sugar, stir and leave to combine. Meanwhile cut the rose petals from their stalks avoiding the yellow or white bitter ends at the base. Set aside. Juice your lemon and set aside. Put the strawberries and sugar on a low heat and stir until well dissolved. Bring to the boil and cook on a rolling boil for 20 minutes. You will get a lot of foam sticking to the sides, just scrape down the sides with a wooden spoon and incorporate it into the jam. After 20 minutes test the jam by placing a teaspoon of jam on the cold saucer. Wait half a minute. And if it wrinkles when you push your finger through the jam it is cooked. Keep the jam on the heat and add the rose petals and the lemon juice. Stir well and cook for two more minutes. Add the rosewater if you wish. Remove from the heat and stir the jam well to incorporate the petals. Take the warm jars out of the dishwasher (or oven if you are sterilizing it that way) and prepare your funnel and ladle and lids. Wait five more minutes, stirring continually and then ladle the jam into the jars. Seal immediately and allow to cool. « The sublime second batch	» Call this gardening? Just sewing that magic carpet now.